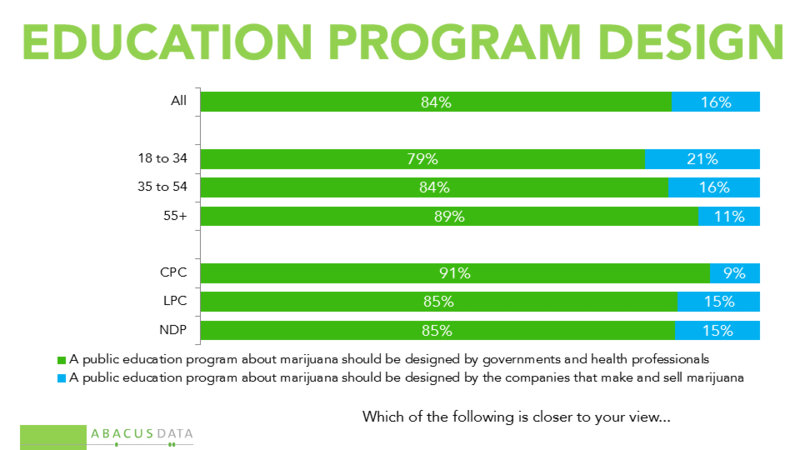 Our latest nationwide survey included questions related to the federal government’s announced plan to legalize marijuana. 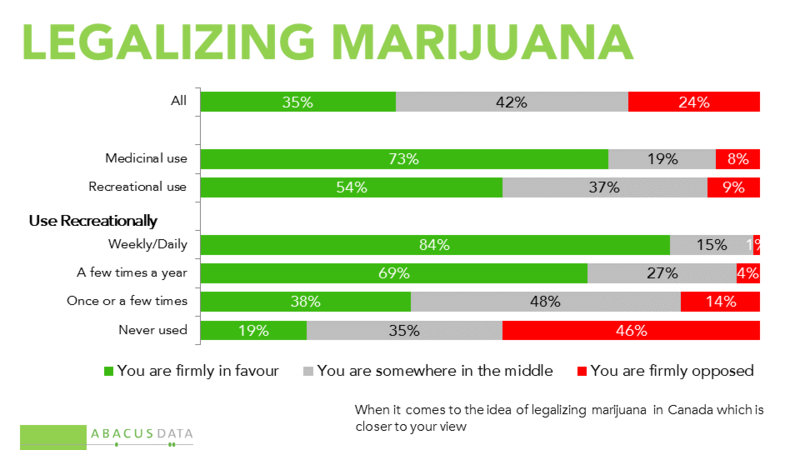 • 35% of those surveyed are “firmly in favour” of the idea of legalizing marijuana, 24% firmly opposed, and 42% say they are “somewhere in the middle”. Younger people are more likely to be in favour but still only 45% of the youngest age group is “firmly in favour”. Opposition doesn’t really rise with age: older people tend to be more “in the middle”. 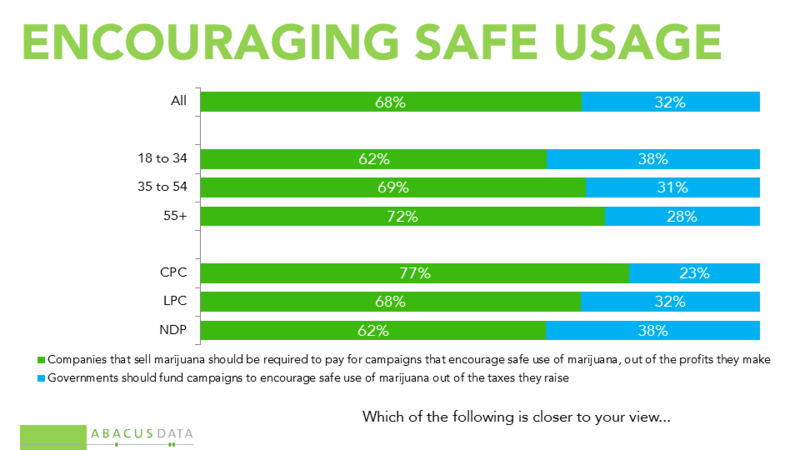 • Just under half of Conservative voters are “firmly opposed” to the legalization of marijuana. Just under half of Liberal and NDP voters are “firmly in favour”. Attitudes don’t vary much by region, or on the basis of whether someone lives in a rural, suburban or urban area. 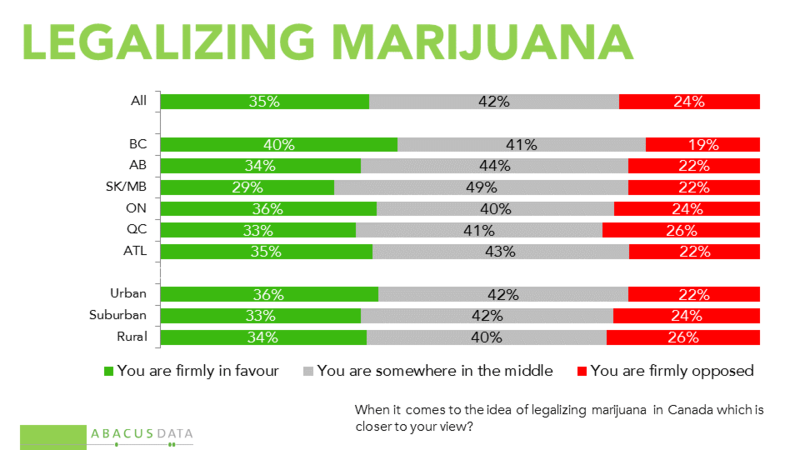 • Among those who have used marijuana, especially those who have used it for medicinal reasons, support for legalization is quite a bit higher than average (73%). Those who use marijuana more frequently are more likely to support legalization. 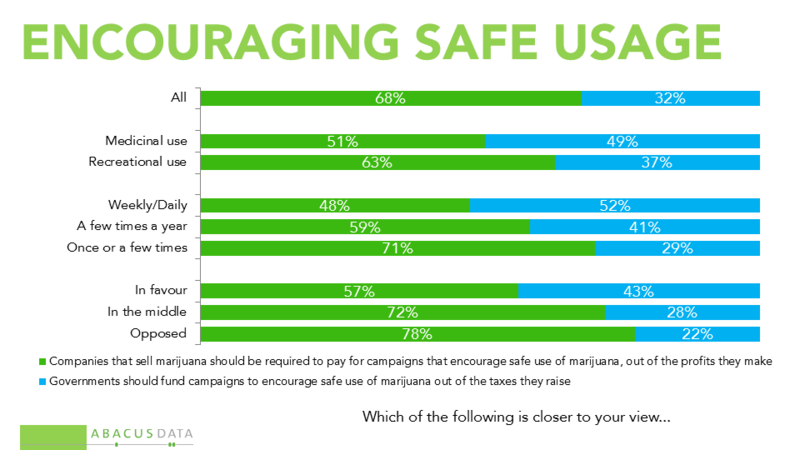 These ideas earn larger than average levels of support among those who are “in the middle” or “firmly opposed” to legalization, indicating that they are conditions that can help make hesitant voters more confident that this is a reasonable policy step, and opposed voters less anxious about the potential consequences. 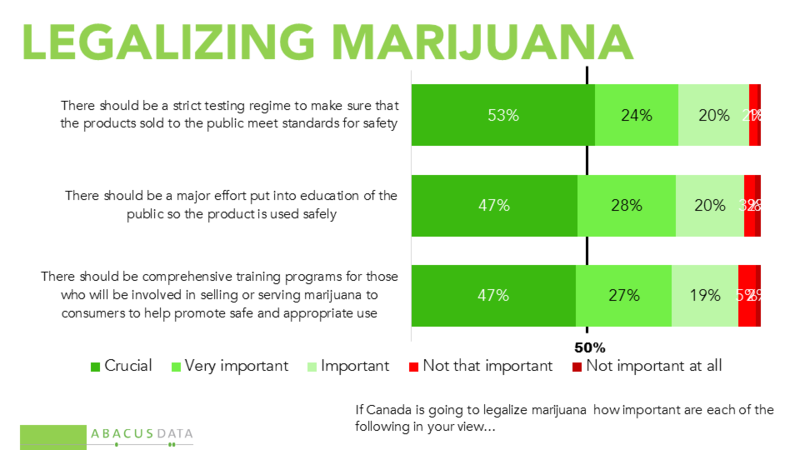 When it comes to the design of public education program to promote safe use of marijuana, the strong preference is that this type of program should be designed by governments and health professionals, rather than by marijuana producers or marketers. At the same time, most would prefer to see the costs of such a program borne by producers out of their profits, rather than by taxpayers. 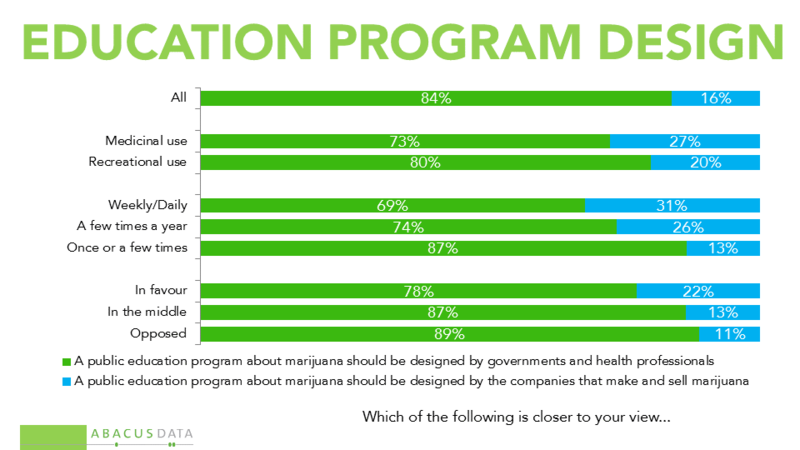 Conservative voters and those in the middle or opposed to legalization are more likely than average to want to see government involved in the design of a public education program, but private companies required to pay the costs of such a program. Bruce Anderson: “While some may be urging Ottawa to act on its legalization pledge with more speed, these numbers suggest that few Canadians feel that the pace of action is too slow. Instead, they paint a picture of a public that is more inclined to support than oppose this direction, but looking for care to be taken in the execution of this policy. 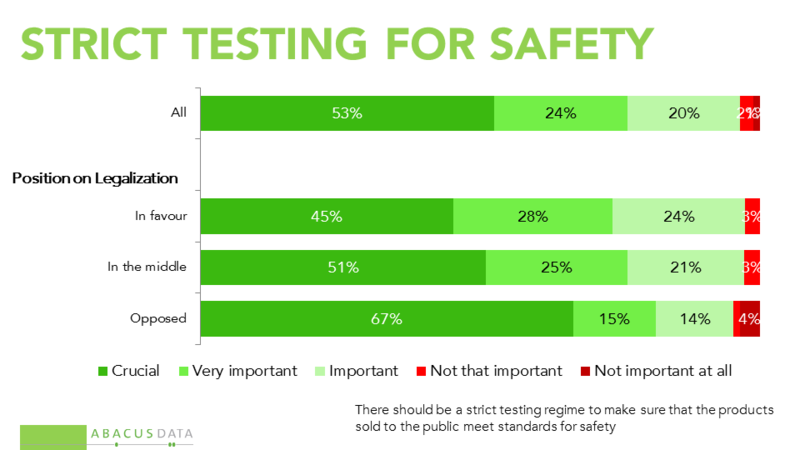 That people believe there needs to be testing, training and education about the safe use of the product indicates that they feel there are risks that need to be carefully mitigated. 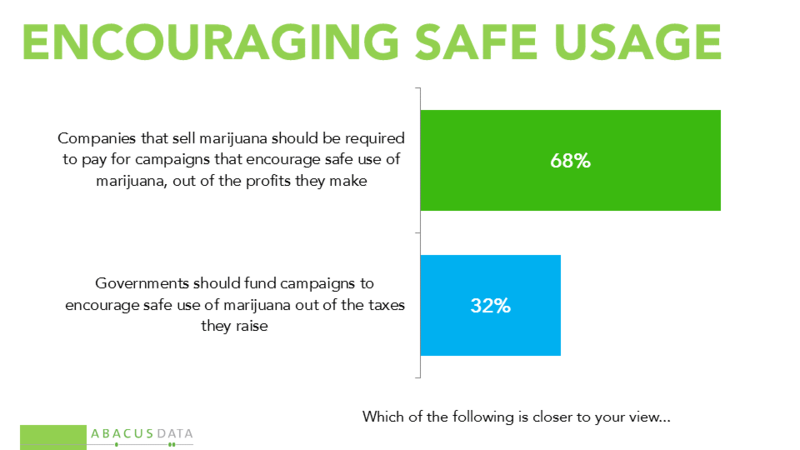 Clearly, people believe government should take a measure of ownership when it comes to ensuring safe and responsible marijuana use. However, they also believe that any financial burden associated with this type of programming could reasonably be assigned to the companies that will earn profits in this market. 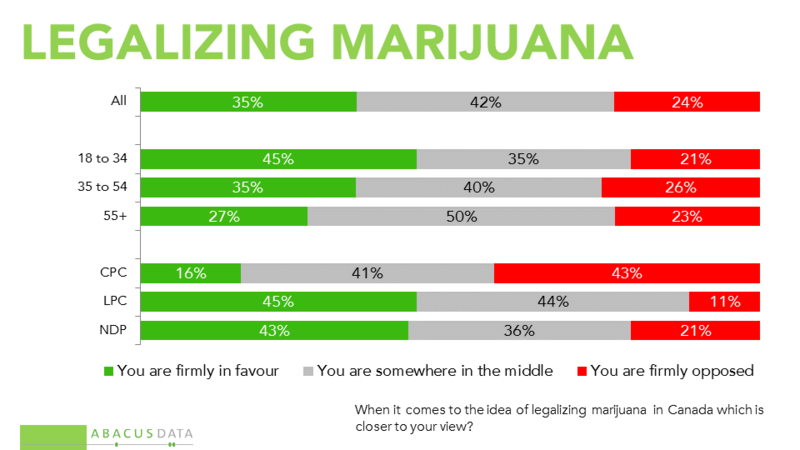 David Coletto: “The proportion of Canadians opposed to legalizing marijuana is not as large as many might assume and it appears that opposition may be softening given the government’s measured approach to legalization. Moreover, our data finds that there’s a significant portion of the public who are open to persuasion especially those who have not used marijuana in the past and those aged 55 and older. Our survey was conducted online with 1,500 Canadians aged 18 and over from June 14 to 16, 2016. A random sample of panelists was invited to complete the survey from a large representative panel of over 500,000 Canadians. The margin of error for a comparable probability-based random sample of 1,500 is +/- 2.6%, 19 times out of 20.